Here at Dunowen, it’s all about the sea. Surrounded by secluded coves, sandy beaches and rocky cliffs, the light, sounds and smell of the fresh Atlantic Ocean influence so much of how we live our lives here. Nestled in the heart of the unspoilt West Cork countryside, yet only 10 minutes from bustling Clonakilty town, Dunowen House offers a wonderful selection of outdoor activities, exceptional food, traditional Irish entertainment and the friendliest of welcomes. For the more active, we can organize sea kayaking, surfing, fishing, horse riding, cycling or hiking adventures, all within five minutes of our doorstep. The secluded Sands Cove at the end of the lane-way is the perfect hideaway for a picnic, to be lulled by the rolling waves, while admiring the ever-changing skies and sea-life. Walk to nearby Red Strand, with majestic Galley Head Lighthouse a beacon on the horizon. 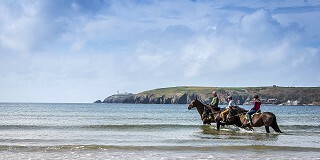 Annually named “The Best Beach in Ireland”, Inchydoney is only 10 minutes drive from Dunowen House. Walk the beach and dunes, take some surfing lessons or simply sit and enjoy a refreshment while you watch the world go by on the terrace of the Inchydoney Island Lodge Hotel. Stroll through the buzzing market towns of Clonakilty or Skibbereen, sampling gourmet treats and a welcoming atmosphere. Nip into one of the many traditional pubs, where local and international musicians can be found in session on a nightly basis.